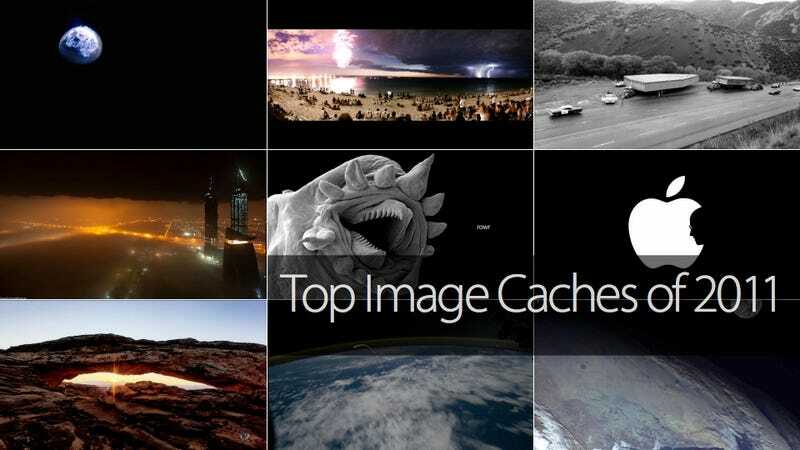 This is probably one of the most beloved features of Gizmodo: image cache. It's where we put the most beautiful, the most striking, the most most images and videos of the web. Here are the best of 2011. One of the many, many amazing bits of photo and video being run in The Atlantic's powerful package on nuclear testing in the US is this shot. Over the course of 15 years, award-winning photographer Yann Arthus-Bertrand crafted the most beautiful view of the Earth I've ever seen on the silver screen: Home is an exquisite vision of our world, full of pure bliss—and terrifying scenes. The spacecraft was a long way from home. A night of fireworks, lightning, and a comet hanging on the sky separating them. It's like a painting of Heaven, Earth and Hell by Hieronymus Bosch. But it's not a painting. It's a real sky. It happened in Perth, Australia. 4. How Do You Transport a Super-Secret Plane When You Can't Fly It? In a giganormous wooden box, that's how. This is how Lockheed Martin was transporting this ultra-secret A-12 OXCART—the precursor to the SR-71 Blackbird— developed under the supervision of the CIA. That's a bomb squad officer about to inspect a car suspected of containing a bomb planted by a muslim terrorist group in Thailand. The following images capture the horrible destruction as the car suddenly explodes in front of him. Let's hope that no mad scientists discover an augmentation ray, because I would not like this hydrothermal worm to be the size of a whale. Heck, I don't even want it to be the size of a striped bass. When I first saw this image just released by NASA I just couldn't believe my eyes. It shows Atlantis re-entering the Earth's atmosphere from the International Space Station, leaving a trail of fire behind it. We have our own tribute video to Steve Jobs and people have been creating quite smart pieces all around the web. This brilliant one was created by Jonathan Mak but there are many more. Here's a selection of the best. Gizmodo friend and amazing filmmaker and photographer Vincent Laforet says that calling this time lapse video of Utah and Arizona "breathtaking" is an understatement. He adds "Holy cow". Make sure to watch this at full screen and HD. Earlier today, we broke the news that Dubai has become Star Wars. I regret to inform you that this dispatch was factually flawed: Dubai is, in fact, Blade Runner, as proven by these exclusive pics from photographer Gerald Donovan. Been under a rock? See what else happened this year in our Best of 2011 series.